Perhaps the most fun in setting a book in the middle of nineteenth century England is that it is a period of such enormous contrasts. It was a time of great wealth for many. And it was a time of unspeakable poverty. This was the age of the machine, of steam and of industrialization. Today we are amazed by all our electronic innovations, but the mechanical inventions were perhaps even more revolutionary in the 19th century to a people who had always had an agrarian economy. Railways were, of course, the great moving factor, linking the cities and making travel possible in ways unimagined before— although my hero Lord Danvers does prefer his somewhat eccentric hobby of aeronautics as a means of transportation. overcrowding and poverty. But as soon as the Victorians identified a problem, they set to work to solve it. Such Evangelical reformers as The Earl of Shaftesbury waged campaigns for child labor laws, Tractarian priests like Charles Fuge Lowder worked to clear the slums of hunger and disease, Prince Albert himself set about designing model housing for poor families. It was a time of national stability and confidence symbolized by the queen who set the moral tone for the age by beginning her reign declaring, “I will be good.” And who represented the ideal of the family values of the age by having nine children. Lavish fashions, ornate architecture and furnishings, refined manners were all part of the Victorian code. And were all things that have come to be rejected in our far more relaxed age, but give the novelist so much to work with in a fictional reconstructed Victorian world. 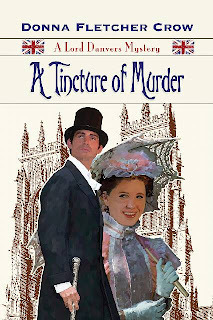 This is the world of Charles and Antonia, Lord and Lady Danvers in A TINCTURE OF MURDER, the latest in my Lord Danvers true-crime mystery series. When I found the case of William Dove, whose trial took place in York in 1856, I knew I had the perfect vehicle for presenting both sides of Victorian society. Charles and Tonia are guests of Sir Gerald Wandseley at his elegant country manor with plenty of opportunities to be waited on by servants and revel in delicious four course dinners followed by desserts and ices. But since York was home to some of the worst slums in England I could present the contrast of the lives of the destitute. For this we have the Reverend Frederick, Lord Danvers younger brother who has taken Holy Orders and, most shockingly, has launched his "Asylum for Poor, Degraded Females" in the worst part of the city. But Freddie’s saintly works may come to a scandalous end when several of the starving women who took refuge in The Magdalen House die under mysterious circumstances. Neither the asylum—nor Freddie’s career—may survive when news of these deaths spreads. William Dove, the notorious “Leeds Poisoner” is on trial for murdering his wife— he can’t be poisoning the fallen women at the Magdalen Asylum. So who is? Is another madman stalking the streets of York? And what is causing the foul stench at the orphans’ school? A TINCTURE OF MURDER has a bonus in presenting not one, but two true crimes. The trial of William Dove established legal principles still debated in courts of law today. The other historic crime was far more bizarre than any dreamed up by Dickens, but I don’t want to give too much away. 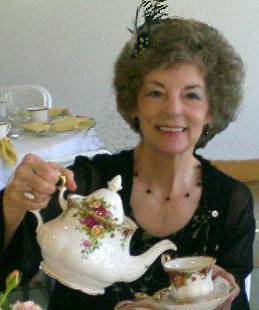 Donna Fletcher Crow is the author of 43 books, mostly novels dealing with British history. The award-winning Glastonbury, A Novel of the Holy Grail, an Arthurian grail search epic covering 15 centuries of English history, is her best-known work. She is also the author of three mystery series. Her newest titles are: An Unholy Communion, The Monastery Murders; A Tincture of Murder, The Lord Danvers Victorian true-crime novels; and A Jane Austen Encounter coming soon in the romantic suspense series The Elizabeth & Richard Mysteries. Donna and her husband live in Boise, Idaho. They have 4 adult children and 11 grandchildren. She is an enthusiastic gardener. True crime, true place, true scenery and true history... a truly enjoyable book. Thank you so much, Melissa. I'm delighted to be your guest today. I love meeting new readers and I love talking about the Victorians! speaking of contrasts: I particularly love your settings being in Victorian England and knowing you live in Idaho. Thank you for this interesting article. Elizabeth George also sets her novels in England, and she lives in Washington State, as I know you know. Wow, Sheila! Are you on the ball! you got here before I did. Thank you for your lovely comment. Oh, yes, joan--7000 miles from "the scene of the crime" it makes research a challenge, but perhaps gives an opportunity for perspective. The bottom line is simply writing from one's passion (and ignoring jetlag)! Most interesting. The Victorians are still a source of fascination, deservedly. But they had their dark policy side as well - failure to respond to the Irish famine, for example. Still, the complexity of the time is an ideal spawning ground for fine mysteries, such as Donna's. Look forward - with my cats - to more fine reading. Fascinating. I agree that all these extreme contrasts in Victorian society are perfect fodder for novelists! "Tincture of Murder" sounds just up my street & I shall have to download it to the kindle soon! Re Victorian society, I know that it has proved a source of inspiration to many others not least Sarah Walters in her gripping novel "Fingersmith" - although of a different genre to yours, Donna, still a good example of what you are talking about, & utterly compelling.